Looking for rugged, attractive, long-lasting backyard storage? 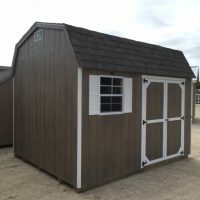 At Lone Star Structures we specialize in handcrafted storage sheds. Built by skilled craftsmen, we use only the best quality materials. 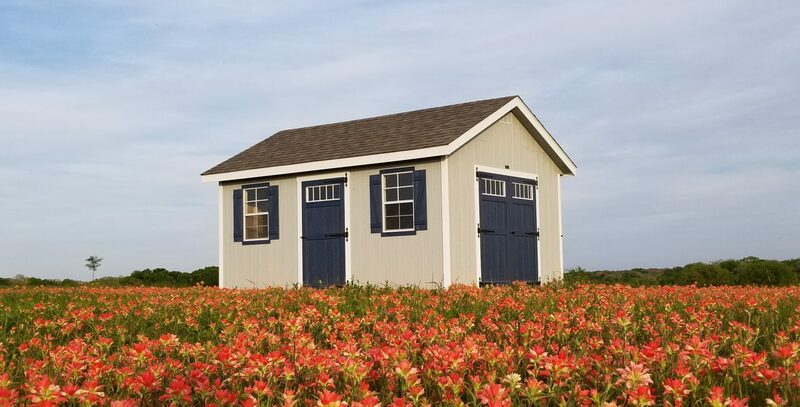 Our storage sheds are available throughout Central Texas. They are ideal for storing lawn furniture, garden tools, pool supplies, bicycles, sports equipment and much more. These are the ideal solution for hunting cabins, small vacation cabins, or just to add a beautiful guest house to your property. 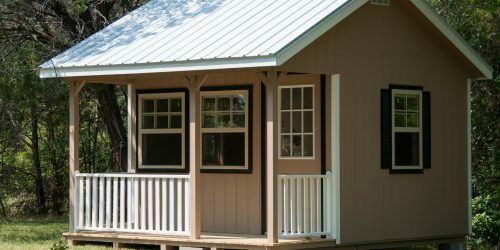 Our cabins come standard with a 4′ porch and are modeled after our Classic style sheds. These sturdy greenhouse sheds are designed so that they are ready for plants on arrival. They are built with painted interiors, pressure-treated floors and workbenches, and a poly-carbonate greenhouse roof. So now you can get an early start to your gardening for years to come. 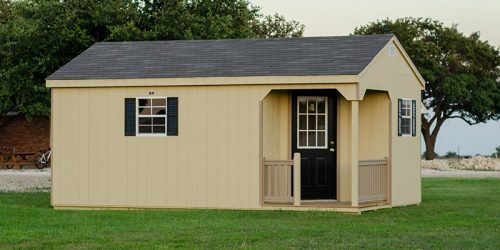 With a 6×6 corner porch and entry area these buildings are a great solution for home offices or guest quarters. Standard features include a 9-lite steel door and 7′ sidewalls. 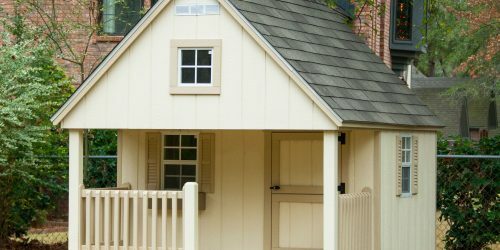 Encourage imagination and outdoor play with a finely crafted kids playhouses from Lone Star Structures. 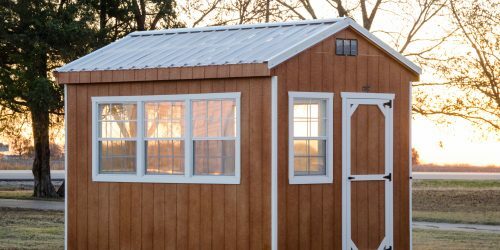 Built with the same high-quality materials as our larger storage buildings, children and grandchildren alike will enjoy this fun addition to the backyard for years to come. 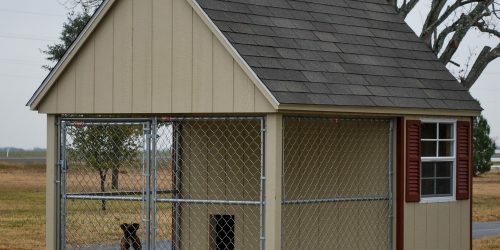 Provide shelter and security for your dog in every season with top-quality outdoor dog kennels for sale from Lone Star Structures. 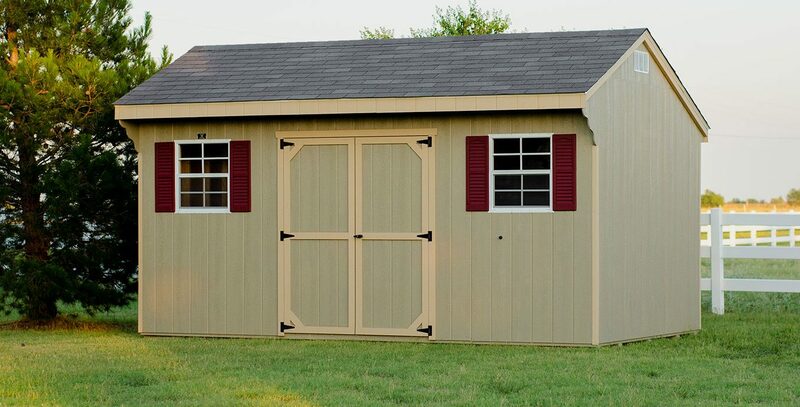 Built with the same quality materials as our line of storage sheds. Now you can provide a safe and comfortable haven for your dog in any weather. If your site cannot be accessed for a prefab shed delivery, we can provide on-site building services. If you need a shed, we’ll get it to you one way or the other. All of our buildings are available for on-site building for a 22-25% price increase. Looking for long-lasting outdoor furniture for your deck, patio or backyard? Enhance the beauty of any outdoor space with the warmth and beauty of real wood furniture, handcrafted from top-quality materials. We build our wood patio furniture for real life So, it weathers well and stands up to heavy use season after season. 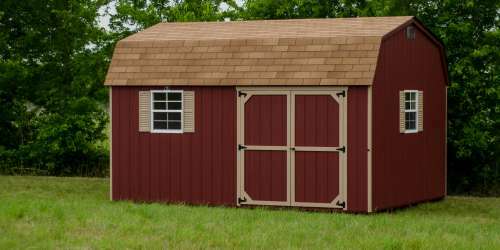 Are you searching for outdoor storage sheds? Or maybe you are dreaming of a cozy playhouse for the kids? How about a great home for man’s best friend? You have come to the right place. 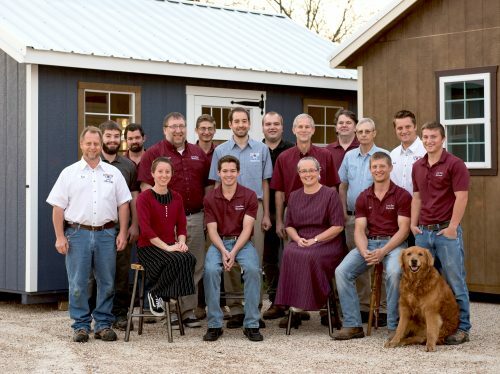 Lone Star Structures delivers top-quality outdoor buildings made in the Amish Mennonite tradition. 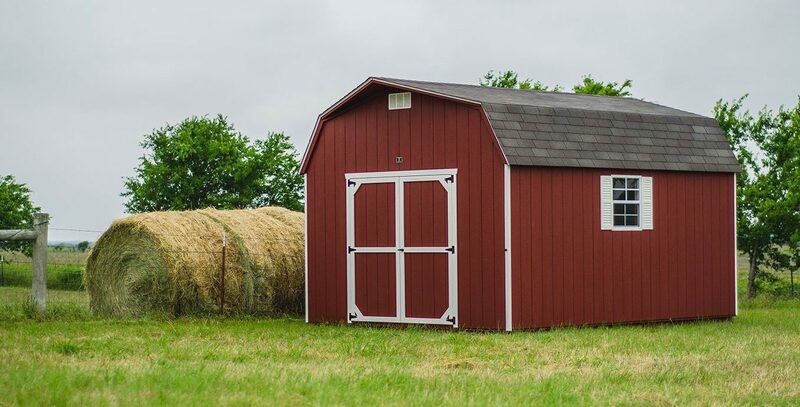 The Fisher family was originally from Lancaster County, Pennsylvania, the home of top-quality Amish storage sheds. In 1997 they moved to Lott, TX and started making and selling storage sheds. Since then they have been putting the carpentry skills to work and offering quality wood sheds for sale throughout the central Texas area. 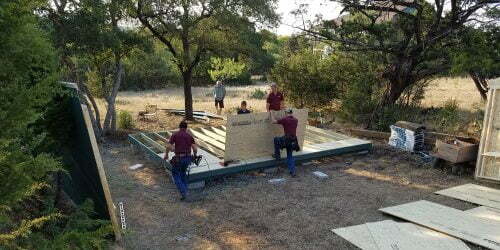 Today, Lone Star Structures is known throughout the central Texas region for top-quality outdoor sheds. 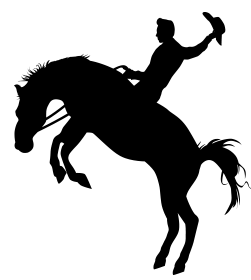 They offer a variety of styles to suit their customers’ needs. 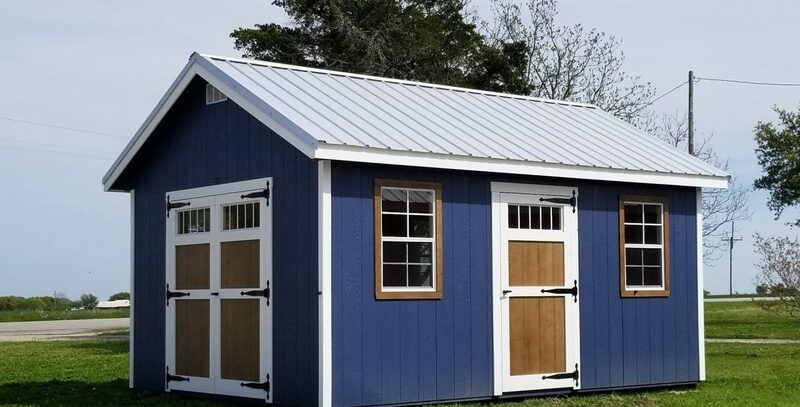 In addition, Lone Star Structures has expanded their product line to include dog kennels, stand-alone offices and cabins, prefab garages, wagons and outdoor furniture. And everything is still made with the same quality standards as their original outdoor sheds. So if you’re looking for wood sheds for sale in the central Texas area, Lone Star Structures is the only name to know! "Our goal in business is to put Christ first and serve our customers with honesty and integrity. 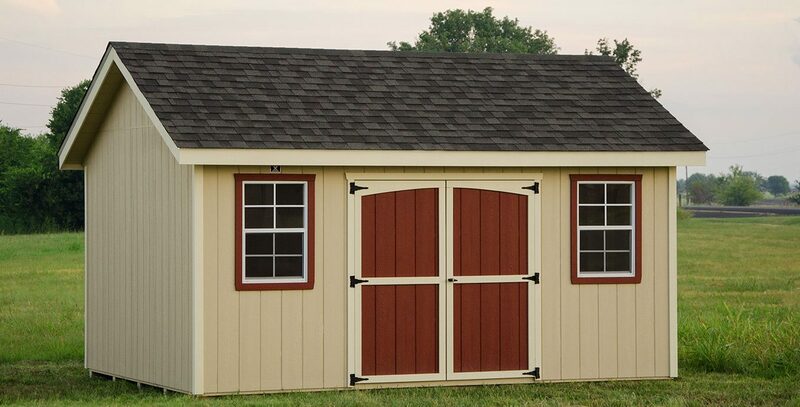 We are committed to give you the best outdoor storage sheds for your money!" Choose an In-Stock Building...Ready for Delivery! We LOVE our Lone Star building! We have a 12×16 shed that we have actually been LIVING in since mid-August while we build our ‘real’ house on our new property. They’re THAT solid! We have had torrential rain and wind and everything Texas has to offer. We had an electrician wire it (to code) for us and also plumbed it via a professional. I really think these buildings are TOO NICE to store an old lawnmower in. We are going to use the building as a candle, soapmaking, and food canning workshop behind our regular house in the future. This is our second Lone Star shed. The first one was purchased in 1996 and is still standing strong at our previous house. They are both well built structures which handle the Texas weather well. Y’all built me a custom Dutch Barn & delivered it to Shiner on Aug 10th. I just felt like letting you know how much I love the building. Everything went perfectly. The building was just as I had ordered it, & the driver (Joe I believe) did a superb job of placing & leveling the building. That guy is worth a lot, a real professional. The way he handled that “mule” was just fun to watch. Now I’ll have fun building my workbench & some shelving & then stocking the shed with my stuff, knowing it will all be safe & secure for many years. We are so pleased with our Dutchbarn shed! I liked the 16” o.c. construction, price & quick delivery of product! Lone Star Structures always does a good job! Thanks you for the timely delivery, placement, and setup. Very professional! Jeremy did an outstanding job. Thank-you very much! Great job! He put it exactly where I wanted it even though it was hard to get to. The process was so easy from start to finish! You guys did a fantastic job! Great quality and all the details. Thanks a million! Thank you for all your work! The shed looks great! We only wish we could get the same satisfaction from other companies we have to work with. The men who came to assemble the shed were very well mannered, hardworking and even cleaned up the area! Ya’ll do such wonderful work! Did as nice of a job as you could ask for. The fine young men did a fantastic job! Guys did a great, outstanding job! It’s a pleasure doing business with you. Kevin did a fantastic job! We will recommend highly to everyone. Thanks for great service!